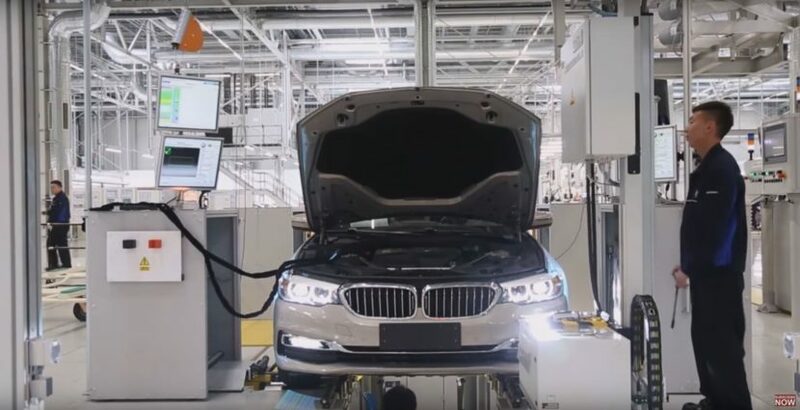 The new BMW G30 5 Series didn’t just bring along a refreshed look and new engines, but it also delivered new manufacturing processes at BMW’s plants. Its assembly lines have been decked out with the latest technologies available, as part of BMW’s Industry 4.0 project. Even before the car was officially unveiled to the public, BMW announced that in its development some innovative technologies were used, to make sure the highest quality standards are reached. Among them we found mention of new 3D sensors that could spot even the smallest irregularities or defects that would otherwise not be noticed by the human eye. Furthermore, even before that, the Germans also introduced new support braces for workers that had to stand up for long periods of time, along assembly lines. All of these new technologies can be seen at work not only in BMW’s German plants but in its Chinese ones as well, as the video below shows. The BMW 5 Series is assembled locally for the domestic market in China. The Chinese customers also get a long wheelbase model that is extremely popular among fans of the brand in the Asian country. However, despite stereotypes, the BMW plants in Shenyang are just as well equipped as those in Germany. The whole process of putting together a 5 Series in the Dadong plant in China is showcased in the 20-minute video posted below and we have to admit, it’s quite impressive. It shows how everything is done, from painting down to the last quality checks before the cars are rolled out of the factory. If you’re a fan of How It’s Made, this video will surely be to your liking.